For all the ideas Japanese baseball has lifted from its MLB counterpart in North America, it’s surprising a proper Hall of Fame ceremony hasn’t been one of them. 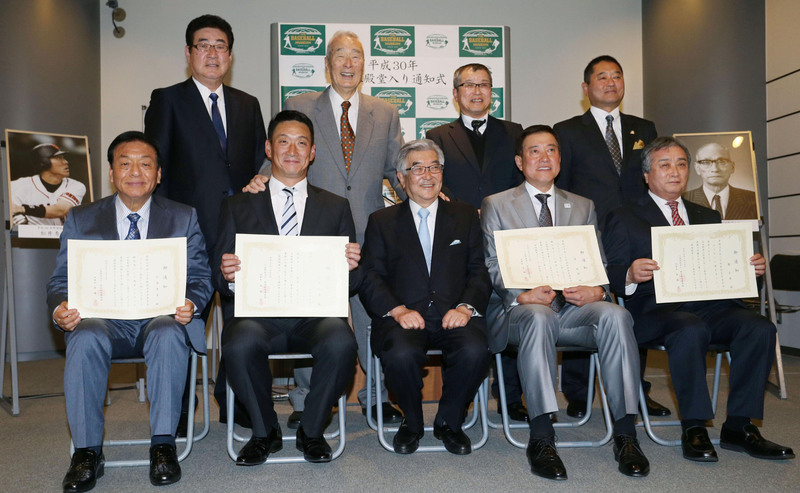 This year’s Japanese Baseball Hall of Fame class was a doozy, including among others, former Hanshin Tigers and Hiroshima Carp great Tomoaki Kanemoto and former Yomiuri Giants and Samurai Japan manager Tatsunori Hara, two giants among Japanese baseball fans, and also Hideki Matsui, a superstar in Japan with great name recognition outside the country — he’s on the Baseball Hall of Fame ballot in North America too — because of his MLB career. Their inclusion in the Class of 2018 was revealed at the Hall last week, and those who were present made a few remarks to a room full of mostly media. Later this year, during one of the All-Star games, they’ll be given a moment to be recognized by fans in attendance. They’ll steal attention away from the All-Star festivities for a few fleeting moments and then it’ll be back to business for everyone. It’s better than nothing, but it doesn’t seem to be an adequate way to honor the players who were among the biggest names in the sport and upon whose backs future generations will be built. This is an area where North America gets it right. Cooperstown, New York, where the Baseball Hall of Fame is located, is annually taken over by Hall of Fame fever for one weekend in July. The induction ceremony is just the high point of a weekend that features a parade and other activities in celebration of those being honored. Of course, the induction ceremony is the main draw. The newly minted Hall of Famers take to an outside stage, and give their speeches in front of fans, former teammates, their families etc., under the (if they’re lucky that year) sunshine. The experience in Japan is stale by comparison. It’s confined to one room, with the honorees speaking mostly to several rows of reporters, and held in the middle of a weekday. It’s a normal news conference in many ways, devoid of the spirit and emotion you see on full display in Cooperstown. Instead of Kanemoto and Hara speaking to a room full of reporters, imagine how riveting a scene it would create to have fans of the Carp, Tigers and Giants on hand to give them a rousing welcome into baseball immorality. Or for Matsui, who wasn’t present last week, to make an appearance in front the adoring masses. Japan doesn’t have to create a carbon copy of the North American experience, but it would be nice to set aside a time and place for the Hall of Famers to really have their proverbial moments in the sun. This way, fans could gather and listen to their heroes and react to the moment, instead of experiencing it through the media. Such an event might see a pretty good turnout on a weekend. You’d almost guarantee it by finding a way to have a ceremony outside the stadium a couple of hours before one of the All-Star games. The Hall of Famers deserve to honored, and quite frankly, the fans who supported them throughout their careers deserve a chance to experience the occasion with them. Inducting someone into the Hall of Fame should be a time for celebration, not just another news conference.